New research has shown that young adults are increasing their risks of oral cancer through the lifestyle choices they make. The number of young people being diagnosed with mouth, throat and food pipe cancer has doubled, and researchers believe this is due to excessive smoking, drinking and unhealthy diets among the young. These cancers – known as upper aero-digestive tract cancers – are responsible for 10,000 deaths in the UK alone. Researchers at Aberdeen University conducted a five year study, which examined 350 patients under the age of 50 with UADT cancers and compared the results to 400 people who did not have the disease. It was discovered that nine in 10 of the cancers had been caused by smoking, drinking and a lack of fruit and vegetables in the diet. Professor Macfarlane, who led the study, said, “Our study aimed to determine whether smoking, alcohol consumption and low fruit and vegetable intake remained the most significant risk factors for UADT cancers in this age group, or whether other ‘novel’ factors, including genetics and infection, could be relatively more important. Tobacco is considered to be the leading cause of mouth cancer, and those who drink alcohol and smoke to excess are up to 30 times more likely to develop the condition. 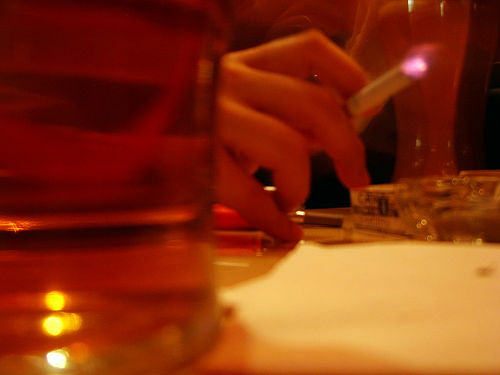 Alcohol aids the absorption of tobacco in the mouth, which transforms saliva into a deadly cocktail that damages cells and can turn them cancerous. Around a third of cases are thought to be linked to an unhealthy diet. Increasing evidence suggests that Omega 3, found in fish and eggs, can help to lower risks, as can high-fiber foods such as nuts, seeds, whole wheat pasta and brown rice. Mouth cancer is twice more common in men than in women, though an increasing number of women are being diagnosed with the disease. Previously, the disease has been five times more common in men than women. Initial signs of the disease include a non–healing mouth ulcer, a red or white patch in the mouth, or unusual lumps or swelling in the mouth.